This is the glorious debut of the undisputed heroes of the New Wave of British Heavy Metal Iron Maiden. This is where it all started for one of the biggest, most influential metal bands the world has ever seen. After four years of many lineup-changes and a demo, Steve Harris and the gang finally got around to record their first album. This is a definite milestone within the metal scene in general even though the boss himself is not very fond of it due to the” poor production and the overall bad quality of the album". It should be noted that producer Will Malone let the band produce most of the album themselves, because he himself had little interest in it. This is also the only album to feature guitarist Dennis Stratton, he was later fired by Harris due musical differences. 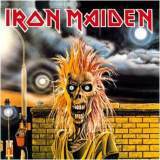 Iron Maiden contained something the other NWOBHM-bands lacked. The raw and edgy almost punk-like sound makes them stick out from the crowd, and many fans appreciated, and still appreciate this. The crunchy guitars are thick and juicy, Harris' slack signature bass follows every move, the drums are simple and fun and the incredible, sometimes raspy vocals of Paul Di’Anno carry this one to the top. Everything is in place, and the interaction between every instrument is flawless. Just listen to how the bass follows every move the guitars make, how incredibly steady Clive Burr's drumming is, the unique dual guitar-solos that later became one of their trademarks, and all the creative twists and turns found throughout this incredible slab of heavy metal. Prowler kicks it all off with energetic riffing, tempo shifts, and a stunning lead section. Dave Murray is probably the most underrated metal guitarist out there. The live favorite Sanctuary carries on with an upbeat and entertaining riff that shows signs of the mentioned punk influence. The slow and intense ballad, Remember Tomorrow haunts you with rough and atmospheric vocals, occasional bursts into heavy riffs and a very catchy and enjoyable solo part. The mysterious lyrics show Di'Anno's creativity, and along with the emotional vocals, this song succeeds in sending a fair amount of chills down your spine. It's doomy, dark and gloomy and is easily one of the better metal ballads out there. After the punky first single, Running Free, it's time for the album highlight and fan favorite Phantom of The Opera. No metal band had ever done this before. The complex riffs and rhythms, the intense vocal lines, the stunning details and the slightly epic middle-section, may have established the foundation of the epic Maiden we know today. The magic interaction is very present here, and I can easily imagine how that incredible instrumental section turned heads and dropped jaws back in the old days. Maybe one of the bands absolute best. Iron Maiden is known for their catchy and lively instrumentals, and their first one Transylvania is no exception. Harris' bass is all over the place and the signature guitar duels and soloing is very present. It's actually not that different from Phantom of the Opera in terms of speed and the creative riffing, which makes this another song quite ahead of its time. Strange World slows things down again with a depressive atmosphere and calm and chilling melodies. It's a pretty straight forward ballad and it's much softer than Remember Tomorrow. The first song of the Charlotte-sagas Charlotte the Harlot is following the same formula as the previous songs. It's varied, with excellent breakdowns and lead sections, and Di'Anno's howling vocals are as rough as ever. The fierce title-track and the band's namesake finish off one of the key moments in the NWOBHM-movement. This album features a side of Iron Maiden that is long gone now. On the other hand, it established some of the elements that are dominant on the later releases. Most importantly though, this is an important record that still influences tons of metal bands and musicians. A true heavy metal classic.